Although pseudocyst formation is common following pancreatitis, their erosion into the spleen is a rare, but potentially life threatening event. 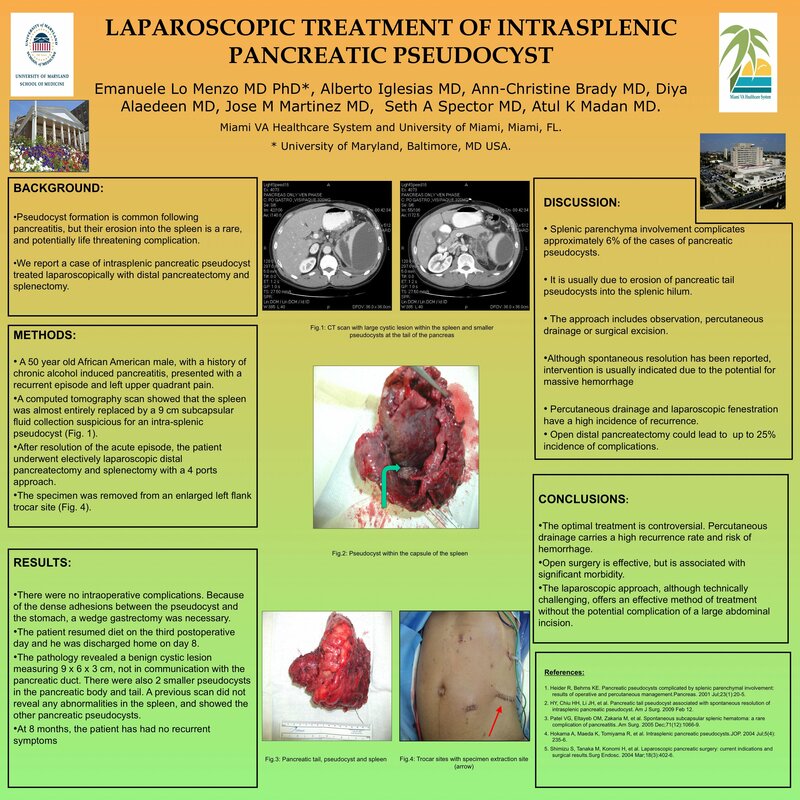 We report a case of intrasplenic pancreatic pseudocyst treated laparoscopically with distal pancreatectomy and splenectomy. A 50 year old African American male, with a past medical history significant for chronic alcohol induced pancreatitis, presented with complaints of a 3 month history of abdominal pain, worsening over the past several days. Initially, the patient was diagnosed with pancreatitis and treated accordingly. Because of the persistent pain, a computed tomography scan was obtained. The spleen was almost entirely replaced by a 9 cm subcapsular fluid collection suspicious for an intra-splenic pseudocyst. The patient underwent electively laparoscopic distal pancreatectomy and splenectomy. There were no intraoperative complications. The patient resumed diet on the third postoperative day and he was discharged home on day 8. The final pathology revealed a benign cystic lesion measuring 9 x 6 x 3 cm in size which was not in communication with the pancreatic duct. There were also 2 smaller pseudocysts in the pancreatic body and tail. A previous scan did not reveal any abnormalities in the spleen, and showed the other pancreatic pseudocysts. At 8 months, the patient has had no recurrent symptoms. Splenic parenchyma involvement is an unusual complication of pancreatic pseudocyst. The optimal treatment is controversial. Percutaneous drainage carries a high recurrence rate and risk of hemorrhage. Open surgery is effective, but is associated with significant morbidity. The laparoscopic offers an effective method of treatment without the potential complication of a large abdominal incision.